Travel to a magical land where the sounds a Muezzin’s calls to prayer echo through the air, intricate minarets dot the skyline and the air is warm and tropical. Cairo has long been a city of much wonderment and mystery – it’s enchanting history, its opulent monuments, and its constant buzz makes it a multi-layered city waiting to be explored. This city is busy (it has over 22 million inhabitants) and it never stops so be ready, but if you are seeking a place pulsing with energy and you can keep up, Cairo may just be the perfect city break for you. Discover the best luxury hotels the city has to offer with our handy guide. 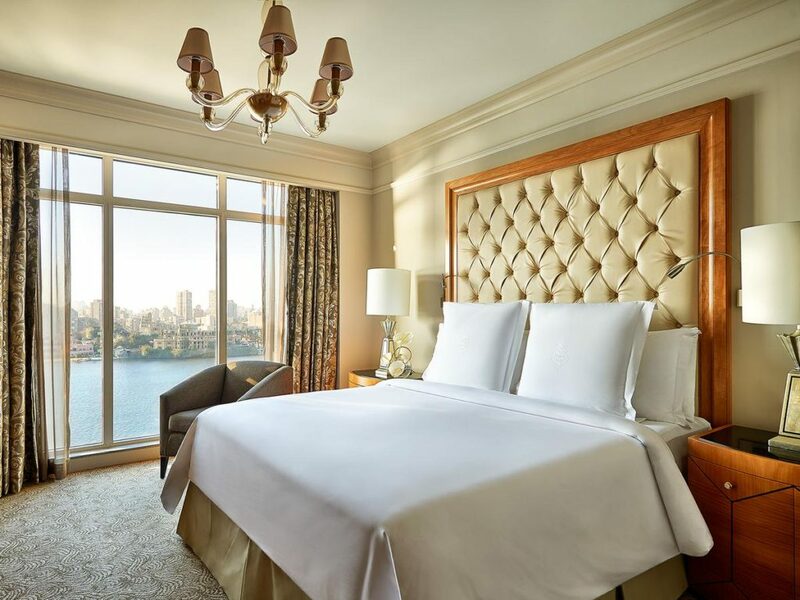 The Kempinski Nile Hotel, situated on the banks of the Nile River in Egypt’s beautiful capital of Cairo, offers its guests a fantastic, 5-star boutique experience. Being in the heart of the capital’s Garden City district, makes the local attractions, shopping areas and the famed Pyramids of Giza easily accessible to guests. With 137 rooms and 54 exclusive suites with private balconies, 4-star restaurants and lounges, rooftop pool, a luxury spa and fitness centre, the Kempinski Nile lives up to all expectations. Guests are treated like celebrities at the Four Seasons Hotel Cairo at Nile Plaza. This luxurious 5-star hotel features panoramic views of the Nile River, air-conditioned rooms complete with a marble bathroom and flat-screen satellite television. A beautifully landscaped outdoor pool area, luxury spa facilities, a salon, gym, indoor pool, car rental and a rich breakfast buffet served each morning are offered for the sole purpose of making sure that their luxury treatment lives up to their guest’s expectations. 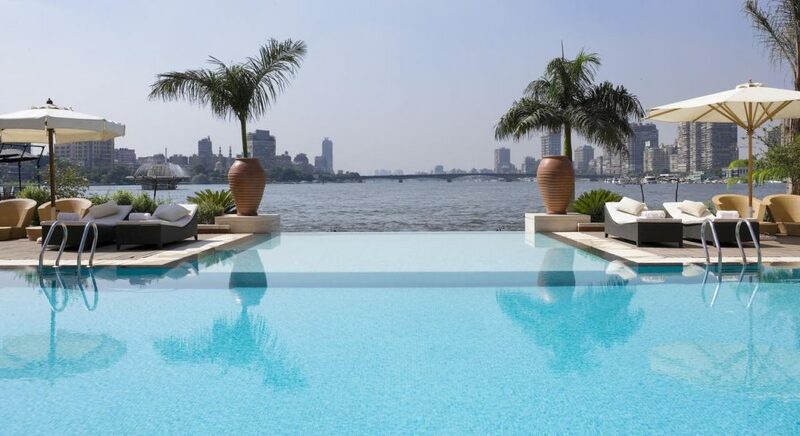 Guests to the Sofitel El Gezirah, a luxury 5-star hotel situated on the River Nile, can enjoy leisurely strolls along the hotel’s private promenade that offers spectacular views of the river. Apart from a variety of leisure facilities, the Sofitel El Gezirah also offers no less than seven restaurants serving Egyptian, Moroccan, Indian and Italian cuisine. Bars on the property include the trendy Window on the Nile and the Le Duplex Bar. Tours and trips of the area can be arranged with the concierge. 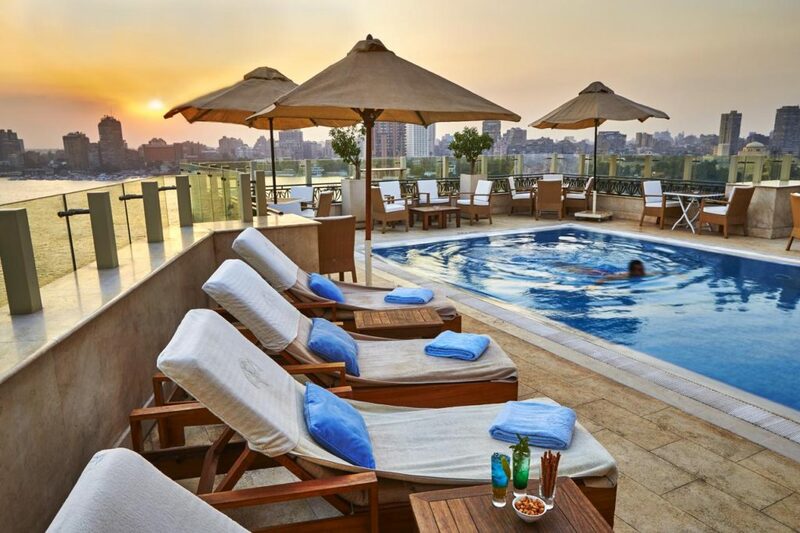 Just a five minute walk from the Egyptian Museum, the InterContinental Cairo Semiramis, a luxury 5-star hotel overlooks the Nile River. It features a variety of facilities, including a heated outdoor swimming pool, a gym, complimentary WiFi, an on-site casino, as well as 24-hour front desk service. All rooms have large balconies offering views of either the city or the Nile River. Satellite flat-screen television, as well as in-room cold and hot drinks are available for guest’s comfort. The restaurants at the hotel offer meals ranging from Thai and Italian to Lebanese dishes and guests can watch professional belly-dancers performing at the Haroun Al Rashid Night Club. 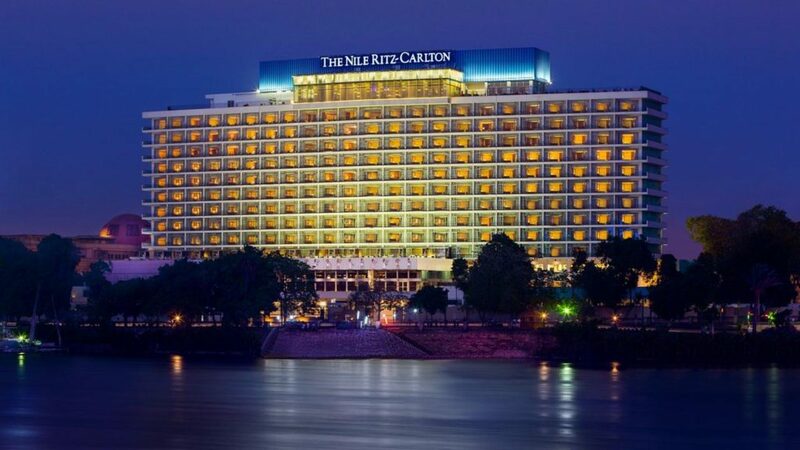 The iconic Nile Ritz Carlton, situated between Tahrir Square, the Nile River and next to the Egyptian Museum, is situated right in the heart of Cairo. Rooms are elegant and spacious, each of them offering a working desk, television and coffee machine. Every room includes a private en-suite bathroom comprised of a walk-in shower and luxury bath. Slippers, bath robes and hairdryers are included too, for guest’s comfort and convenience. The Nile Ritz Carlton also has a casino and plenty of night-life entertainment for guest’s enjoyment, as well as nine top-class restaurants and bars. 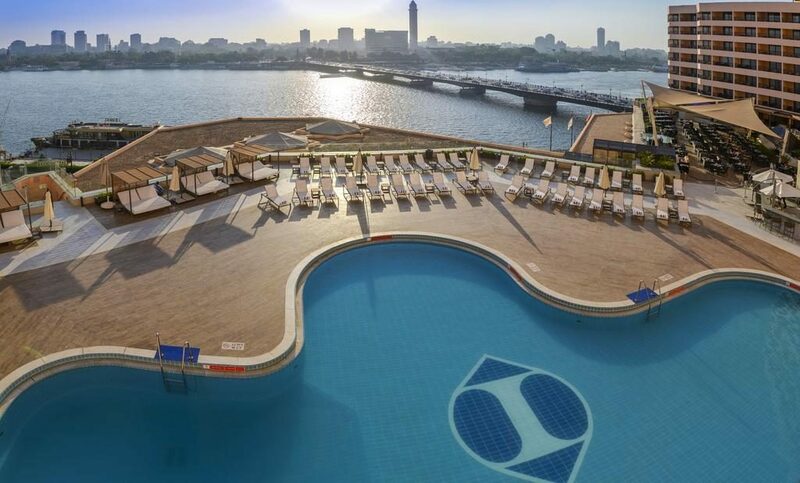 Situated just 23.5 miles away from Cairo International Airport, The Fairmont Nile City offers everything in the line of luxury that guests would expect during their stay. Guests stay in elegant, soundproof rooms, some of them offering panoramic views of the Nile and can choose to dine at one of seven food and beverage venues on the property. 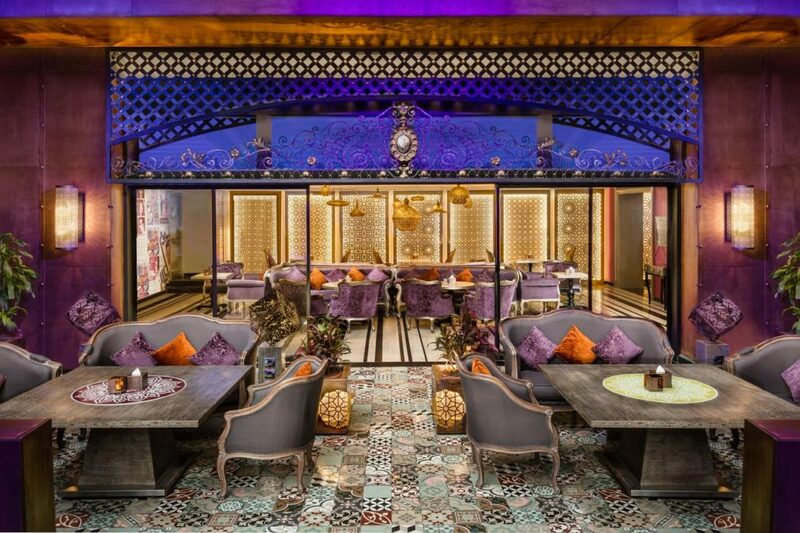 Al Fresco dining on the rooftop terrace is also available and the Bab El Nil provides great Middle Eastern cuisine and night-time entertainment. Le Meridian Pyramids provides guests with the most spectacular views of the magnificent Pyramids of Giza, situated just 1 km away. Guests can lounge around the large, free-form outdoor pool with a bar island, or make use of a hot tub, sauna, gym and a variety of massage treatments offered on the premises. 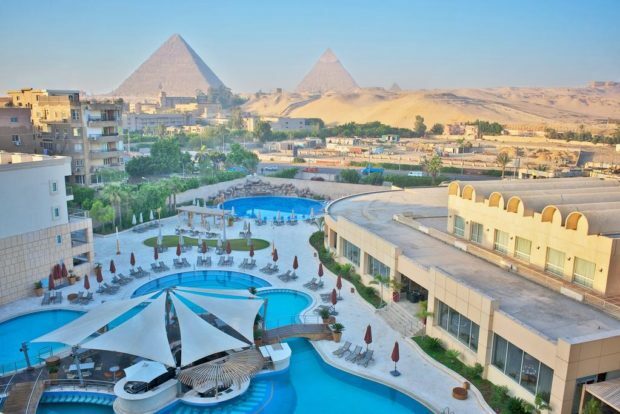 All rooms at the Le Meridien Pyramids have a work desk and flat-screen television, with some of them including a balcony that faces the world-famous pyramids. Dining options include the Latest Recipe where an a la carte menu as well as a 24-hour buffet are offered, Gardenia, where Tex-Mex meals are served in a casual setting, as well as the Citrus Bar, where drinks and snacks can be enjoyed by the pool. Guests can also dine at the shisha café, or enjoy delicious pastries from the Harris Café.